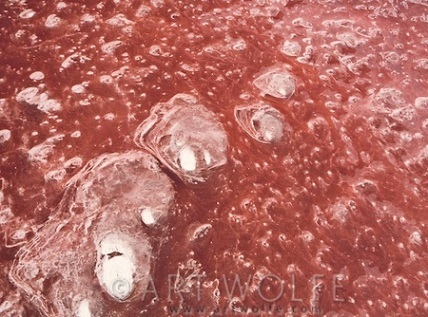 Lake Natron is usually a toasty 80 degrees Fahrenheit and blood-red from bacteria, the only living things that can survive its deadly alkalinity. Lately, it's earned a reputation for washing up the bodies of small animals on its shores, each wrapped in a delicate crusty shroud. 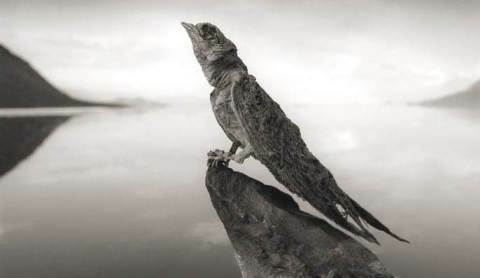 Photographer Nick Brandt was captivated by startlingly well-preserved bodies of bats, flamingos, eagles and swallows, and created a whole series of photographs to document the eerie phenomenon. "I unexpectedly found the creatures — all manner of birds and bats — washed up along the shoreline of Lake Natron in Northern Tanzania," Brandt told NBC News in an email. I took these creatures as I found them on the shoreline, and then placed them in 'living' positions, bringing them back to 'life.'" 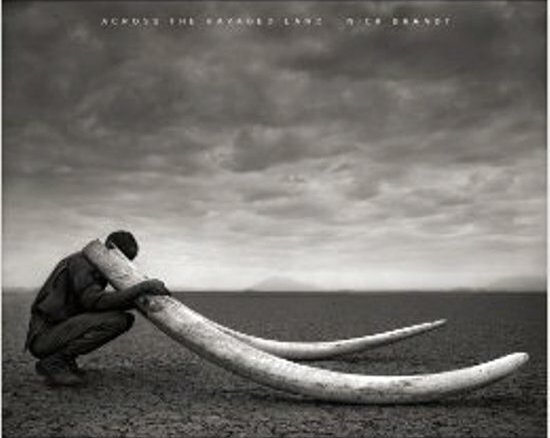 Brandt's photographs have been making their way around the Web, but he's just scratched the surface. The lake is chock full of thousands more well-preserved carcasses — it's so alkaline, creatures that die and fall in don't decompose and wither, they simply get pickled. 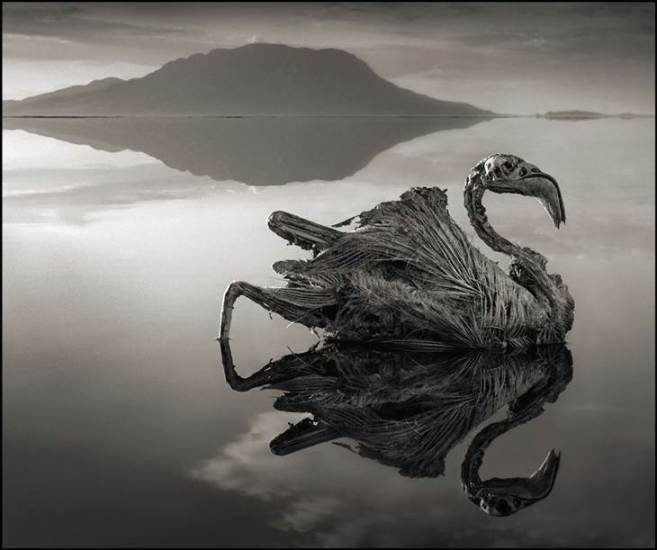 "If a body falls anywhere else it decomposes very quickly, but on the edge of the lake, it just gets encrusted in salt and stays forever," David Harper, an ecologist at the University of Leicester who has visited Lake Natron four times, told NBC News. Flamingos are some of the lucky birds that can make the trip across the lake which is 30-miles wide at its longest point. Still, some of those birds die too. Small birds or bats that try and fail to cross the 12- by 30-mile lake fall in, as do insects like beetles and locusts. Water levels fluctuate easily because it's so hot — when the levels drop, the corpses are left behind on the shores, coated in salt, exactly how Brandt found them. How did the lake get this hostile? The "salt" in it isn't the regular table variety harvested from seawater, but magmatic limestone that's been forged deep in the Earth, poured out in runny lava flows and blasted into the air to become ash clouds 10 miles high. The culprit is Ol Doinyo Lengai, a million-year old volcano just south of Lake Natron. It's a favorite among petrologists because it's the only one of its kind, Hannes Mattsson, a researcher at the Swiss Institute of Technology in Zurich, told NBC News. Other volcanoes usually spew silicates, but the Ol Doinyo Lengai is the only one on the planet that spills "natrocarbonatites" as cool, runny, dark washes. Ashy runoff collected by rainwater winds up in the lake, which explains why the washed-up animals look like they've been dropped in a bucket of cement. The water would "strip the ink off my Kodak film boxes within a few seconds," Brandt said. The deadliness of Lake Natron is exactly what makes it a peaceful mating spot for the flamingos. Except for one extreme-living bacterium, nothing lives in the eerily still Natron, which drives away other larger animals that would stop by to feed or fish. So, after feasting on spirulina algae from nearby lagoons, the flamingos flock to this barren wasteland. If the water level's just right, they court on the temporary salt islands and make mud nests from volcanic dust. Even in a good year, some flamingos that make the trip will die. If they fall into the lake, that's where they'll stay, encased in salty cement, until Natron decides it's time to let them go. 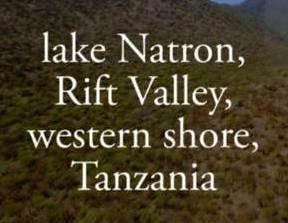 The Rift Valley's Lake Natron is the chosen mating ground of the endangered lesser flamingo. 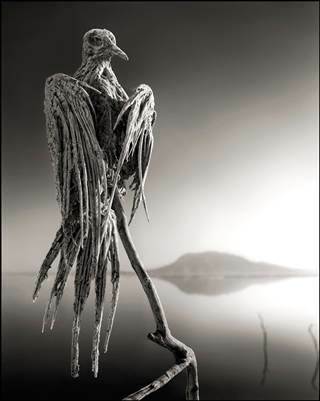 The long-legged waterfowl may flourish, but to any other living creature, Lake Natron is hell on earth. The lake's steeply alkaline waters are a graveyard for thousands of small birds. 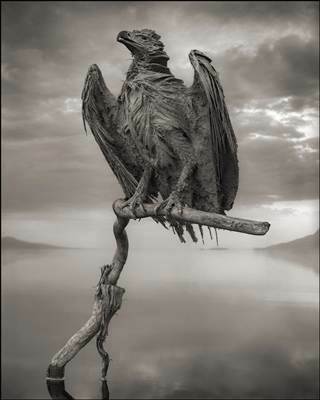 Wildlife photographer Nick Brandt used the corpses littering the Tanzanian lake shores as posed models for a haunting new series of photographs.